Two small prints of butterflies are placed between the two floral sprays. 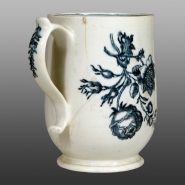 This bell-shaped Lowestoft mug is printed with a popular pattern copied from Worcester called the Natural Sprays Group. It comprises two main naturalistic flower sprays and two subsidiary prints of butterflies. The mug has a painted two-line border on the inside rim.